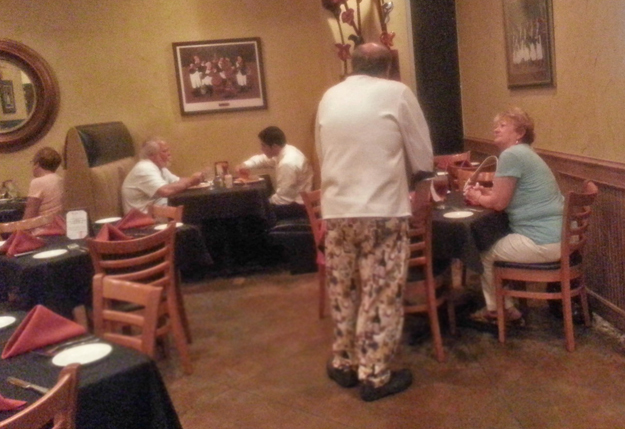 Tucked away in the Palazzo shopping center at 103rd and Memorial in Bixby is a little gem of a restaurant. Once you discover Michael V’s for yourself, you’ll never forget its location. In 2006, Michael and Carol Minden opened the restaurant they designed themselves. Featuring upscale, classical comfort foods, the Minden’s strive to not simply feed their guests, but to give them an experience they’ll always remember. Even when naming the restaurant, they wanted something memorable. After some brainstorming, they decided to use Chef Michael’s middle initial so that the restaurant would not be confused with the popular craft store, Michael’s. The name is not the only thing about this casual eatery that is unforgettable. As soon you walk through the door, well, you just know this place is special. From the warm tones of the textured walls and the vibrant, contemporary artwork to the helpful staff and creative food, Michael V’s is a relaxing escape from the busyness of a typical day. Having visited twice recently for lunch, I have tried several dishes, all of which were well-seasoned, inventive and flavorful. 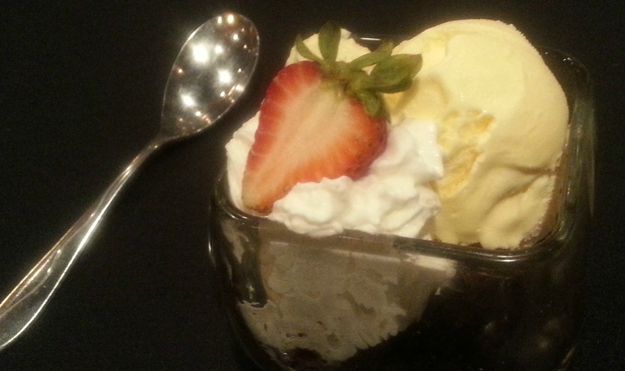 Most recently, I opted for a lighter meal because I was bound and determined to order dessert. I decided on quiche and a cup of soup. On this particular day, the featured quiche had chicken, bacon, spinach, onion and cheddar cheese. I can honestly say that I have never eaten quiche that was so delicious. The individual serving had a tender, flaky crust and a moist, flavorful filling. Usually the quiche is served with a salad, ($10) but I substituted soup instead. The Tomato Florentine soup was light but still hearty, with a subtle hint of tarragon. 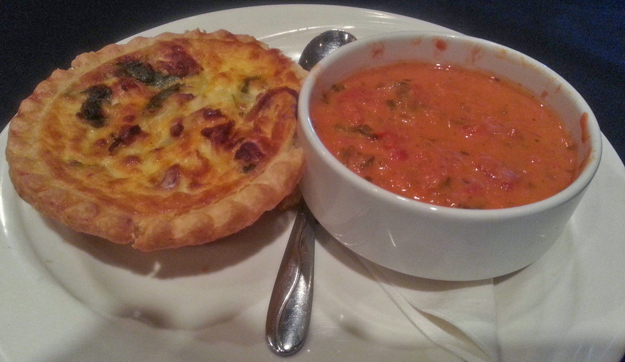 The soup was the perfect accompaniment to the quiche. Lunch came with a roll and some crunchy flatbread that was perfect for dunking into my soup. A delicious, creamy herbed butter came with the bread. I alternated dipping the bread in my soup and in that incredible butter. The restaurant grows basil, tarragon and mint for use in their recipes. I kept my promise to myself and ordered dessert. Although the coconut cream pie ($5.50) is the most popular dessert, I was in a chocolate mood and nothing else would do. The Baked Fudge ($5.50) was rich, decadent and absolutely worth the calorie splurge. On a previous visit, I had Michael’s Signature Salad ($9.50) and my daughter tried the Apple Brie Chicken Sandwich ($9.50). She enjoyed the creamy saltiness of the cheese, contrasted to the sweetness of the apple. It is a perfect combination of flavors. The salad was a feast for my eyes before I ever tasted it. 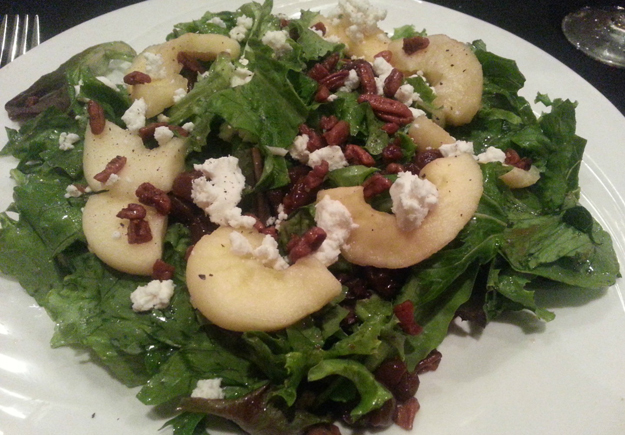 The contrasting flavors and textures of the goat cheese, slightly bitter greens, crunchy pecans and sweet cherries all worked in harmony to make one fantastic salad that was hearty enough for a meal. On that day, I was too full for dessert, but my daughter devoured a piece of coconut cream pie. It was so good, we took a piece to my husband. Both Michael and Carol have worked in the restaurant industry for many years. 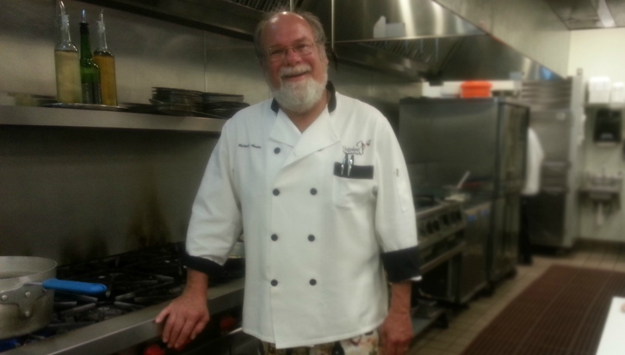 Michael is a graduate of the Culinary Institute of America in New York and has worked for places like Disney and Marriot in both the hotel and healthcare divisions. He also worked at the Chalkboard in Tulsa. Carol has been the catering manager as well as food and beverage director for large hotel chains both locally and across the country. More recently, they owned Back Street Bistro in Jenks. Four years ago, Michael suffered a heart attack. Determined to get healthy, he lost 40 pounds and added lighter choices to his menu. He cooks with little salt, relying on herbs and spices for seasoning. Furthermore, looking around the restaurant, you may notice that salt and pepper shakers are conspicuously absent from the tables. Salt is available if needed, but everything I tried was perfectly seasoned. Instead of using ground black pepper, servers offer fresh cracked pepper to anyone who wants it. Chef Michael, Carol and the entire staff are dedicated to their guests and will go above and beyond to make sure they are well cared for. The chef tells a story about a customer who couldn’t eat anything because she had a bad headache and asked the chef for some Tylenol. Not having any, he personally left the kitchen and went to the store to get her some. Speaking of the kitchen, it is spotless. Anyone can take a tour of the kitchen at any time. Wherever you are at lunch time, take a break and head on over to Michael V’s. It will be well worth the trip and one you’ll want to take often.